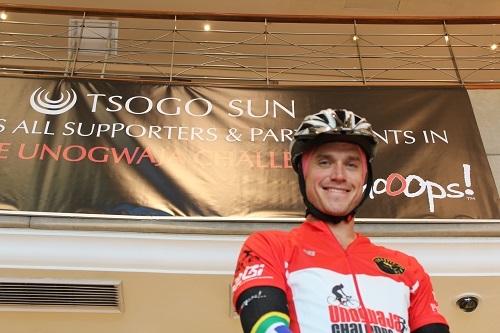 So the Unogwaja Challenge of 2014 is getting closer and the team have already raised an incredible R 270 000 towards the Amabeadibeadi charities. With Unogwaja 2014 being just 69 days away, bikes are getting tuned, bodies are getting fit and hearts are getting full. Event though the challenge itself is only open to 12 spirited individuals, with a support crew of roughly the same size, there are still plenty of opportunities for you to be part of the team. 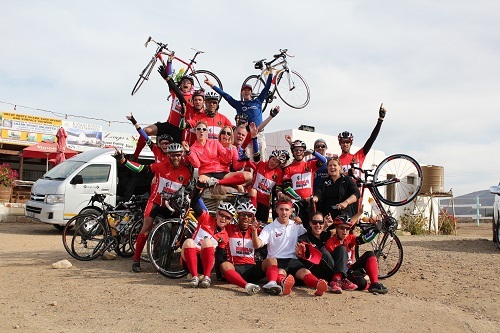 With all the love centered around the start of the Unogwaja Challenge, there are few things more inspiring than being part of a group of 100 cyclists that start the Challenge alongside the fearless 12 Unogwajas. The costs to join in on the cycle is R200, which will go towards Community Chest, Pink Drive and Wildlands Conservation Trust and will include tea, coffee and snacks at the Southern Sun, Waterfront prior to departure at 4am sharp, a pair of ShoOops! socks to don on the ride (and future adventures! ), a great breakfast on arrival in Franschhoek (courtesy of Southern Sun Waterfront) and a chance to bid farewell to the brave Unogwajas in a rousing send-off as they embark upon a 1660km cycle journey across the country culminating in the 89km Comrades road race in their quest to raise R1 million for charity this year. To book your spot on the team for day 1, click here. Last year when I attended the Comrades as part of the Unogwaja 2013, I was touched by how far you can be carried in the race, simply by heart. It was incredible to see the birth of the Red Love Train, a group of people filled with positivity and fun. And in 2014 the Red Love Train is an official part of the Comrades race. You can join the Red Love Train and make a commitment to raise R5000 towards the Amabeadibeadi charities. More importantly you will have the shoulders of others lifting you through the race and carrying you to the finish on the back of a day and a race that will underline the beauty of the human spirit. 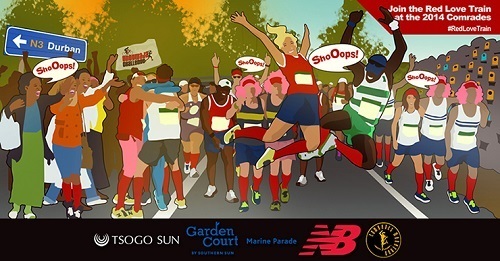 You will also be able to run alongside Jonathan “Joff” Gouveris on the quest to complete his fifth Comrades! To join the Red Love Train click here. Of course you don’t have to be a cyclist or a runner to be part of Unogwaja (See Jabu), all you really need is heart. 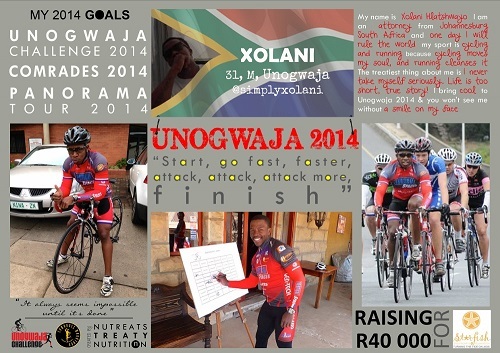 If you are able you can always share a donation of any size with the Unogwaja team in their goal to raise R1 million. You can also read why I chose to support the Sports Trust and go through to Quicket and make a donation. All donations make a difference, to the Challenge and to yourself. And just like any other extreme event or challenge, the team need a full heart and you can definitely help them with this. 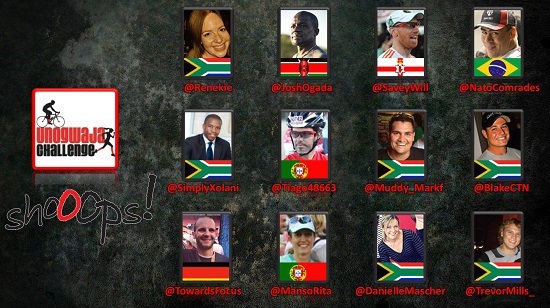 All of the 12 Unogwaja’s are active on Twitter and you can let them know how much they are inspiring you by a simple tweet. The picture below will show you all their handles. If you have any other queries, you are welcome to contact me directly on jabu@allthingsjabu.co.za and I will steer you in the right direction.